For many years propellers on piston airplanes and most turboprops looked pretty much the same no matter who made them. And they actually performed pretty much alike. But Hartzell has changed all of that. 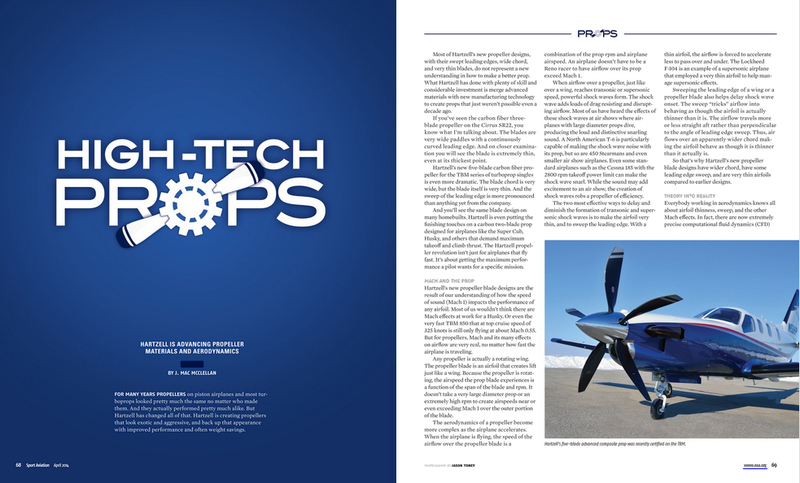 Hartzell is creating propellers that look exotic and aggressive, and back up that appearance with improved performance and often weight savings. A lot of hard work goes into making the best aircraft propellers for sale anywhere; that work is our passion. It is great to see our message about the improved performance, ramp appeal and safety of composite aircraft propellers is getting out. EAA Sport Aviation visited the Hartzell headquarters in Piqua to get a deeper understanding of what makes our composite props so advanced. As propellers spin, their rotational tip velocity combines with an aircraft’s airspeed, causing the air moving across the tips of the airfoil to achieve transonic Mach numbers. This transonic speed creates shockwaves, which reduce performance. Hartzell’s technology reduces these shockwaves by decreasing blade thickness, increasing cord width and adding sweep. We were proud to welcome the Sport Aviation team into our engineering facilities to see how game-changing propeller technology is developed. Read the article and let us know what you thought about it on Facebook or Twitter.